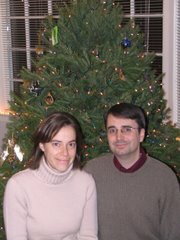 When I lived in California, I used to visit my family at Christmas. Often, this meant traveling to Michigan's Upper Peninsula, where my mother moved after my father's death. She is remarried to a wonderful man who takes good care of her and loves our family. When I would make these trips, I would often have to inform people that Michigan indeed has an Upper Peninsula -- many hadn't heard of it. So, for those who are still in the dark about this, please note the above picture. 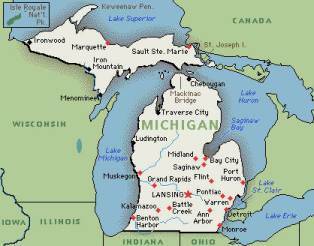 The part that is shaped like a mitten is the "Lower Peninsula." The upper part is the (you guessed it) "Upper Peninsula." While not a particularly cosmopolitan place, the Upper Peninsula has beautiful places to hike and enjoy the outdoors. Now is the time to enjoy this, before winter comes -- roughly late August through April! So here's the news: I'm heading to Michigan to visit family for a week and will likely not be able to post while I'm away. Bible in the Basement will be back in action after May 30. In the meantime, I welcome you to visit many of our fine archives or links! Shominator! I have returned to the world of blogging, with a new blog look, and have written something for your blog, but not sure how much it's worth right now.